Previously in guru series of tutorials we went through initial server setup and configuring Apache, now let us have a look at configuring and optimising PHP. It’s already the most widely used server side scripting language on the web and it’s still growing. Initially developed to be the programming language for the web it has grown into a general purpose programming language. We have already seen the ways to install various versions of PHP in Part I but we need to customise the setup. This is the main configuration file for PHP. It has a list of directives that are used to control how PHP interprets and runs your applications. By default the php.ini file is located at /etc/php5/apache2/php.ini on Ubuntu 14.04 running Apache 2.X.X. There are also separate php.ini files for CLI and CGI versions located at /etc/php5/cli/php.ini and /etc/php5/cgi/php.ini. Following command can be used to find the loaded configuration file. Another method to find php.ini file is to create a php file in your root directory with the following snippet and use a browser to see the output. Your would find the Loaded configuration File listed among details as shown in the screenshot below. Additionally, if you wanted view all the information by calling the function without the constants. INFO_CONFIGURATION Current Local and Master values for PHP directives. INFO_MODULES Loaded modules and their respective settings. INFO_ENVIRONMENT Environment Variable information that’s also available in $_ENV. INFO_VARIABLES Shows all predefined variables from EGPCS (Environment, GET, POST, Cookie, Server). INFO_ALL Shows all of the above. Use the function to know your PHP environment variables. It is key for safety and performance of your server. You can copy them to your php.ini location using the following command and to get started again. ctrl + o to save. Ctrl + x to exit. 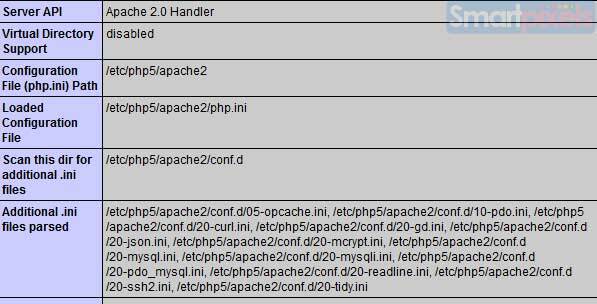 php.ini directives can also be defined inside your virtual host or Apache config files as follows. It’s important to optimise your php.ini settings to utilise the resources well and improve performance. There are numerous directives listed here that you can use to customise PHP but we are going to go through only a few that are of utmost importance to improve performance. This is the maximum time in seconds that a script is executed. Maximum amount of time each script may spend parsing request data. It’s a good idea to limit this time on productions servers in order to eliminate unexpectedly long running scripts. It is a very important directive that limits the memory a script may consume. It prevents the server from running out of memory through memory leaks or intensive usage. Make sure that this value is larger than post_max_size so that regular uploads won’t runout of memory. Maximum size of POST data that PHP will accept.For example if you intend to import a database through phpMyAdmin this setting will limit the size of the database that can be uploaded.This must also be larger than upload_max_filesize. Edit and save php.ini. Then restart Apache using the command. for the new php.ini setting to be reflected. Your php.ini file can also have directives for PHP extensions but that is for another set of tutorials.We will go through configuring and optimising MySQL ( MariaDB ) in next series as a follow up.